What a bear of a summer this has been! The heat has been quite oppressive, and as much as I would like to kid myself, we most likely have at least another month of summer to come. I went looking for a recipe that offered some heat relief and was excited to come across this cool, refreshing drink dreamed up by Kathy Patalsky of kblog.lunchboxbunch.com. I’m sold. This drink is my absolute summer favorite! Watermelon is always a treat. There is nothing that can tame the flame of summer like sinking your teeth into a crisp slice of ice cold watermelon. 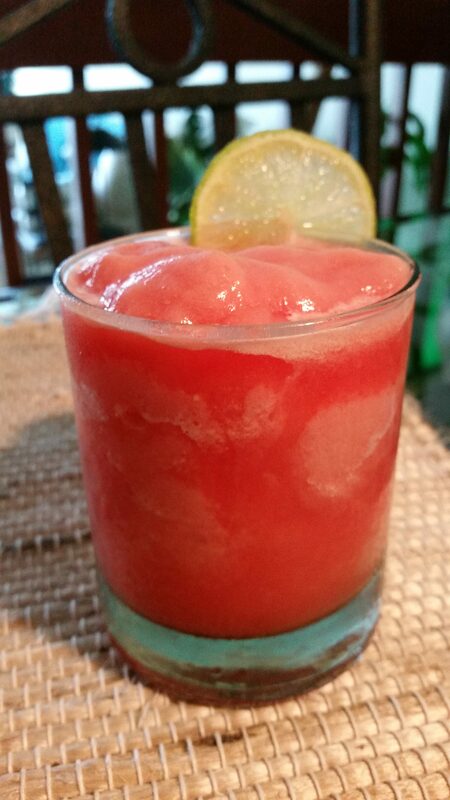 That alone is divine, but this slushy, icy drink includes a tiny hint of tropical flavors like banana and coconut. It’s super easy to put together – just make certain to freeze the watermelon ahead of time. Whip it up and kick back to enjoy!